Reapit Ltd, the largest CRM and Lettings Accounting software provider to the UK residential real estate sector, is celebrating after another awards success at The ESTAS, witnessed by a very special guest. Heads turned at the ESTAS Awards Ceremony on Friday 20th April when Reapit’s guest of honour made an appearance at the event. 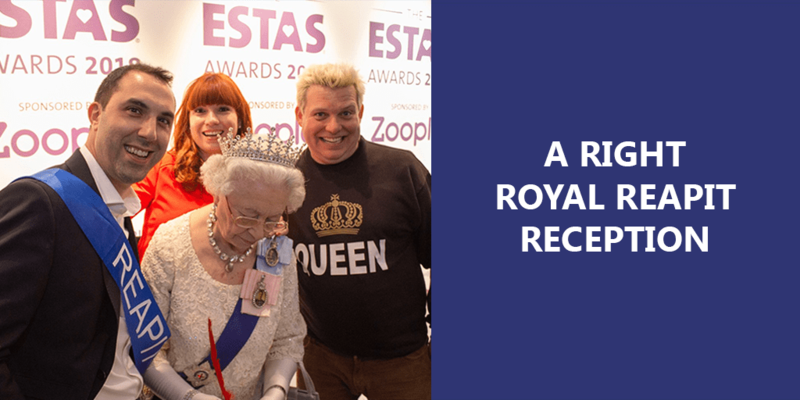 ‘Her Maj’ was an instant hit with the ESTAS audience who clamoured to have photographs and selfies taken with her. Queenie was also revisiting a favourite childhood venue; she and Princess Margaret used to have ice-skating lessons in the Great Room at Grosvenor House in Mayfair when they were young. Later that afternoon the Reapit team had further cause to celebrate with ‘Her Maj, ’after being named Best CRM Software Provider for the second year in succession. Reapit’s client satisfaction score according to the ESTAS report was 97.3%. The honoured guest also bore witness to celebrations for Reapit’s exclusive reseller; JET Software, who recently signed their 100th client; Giggs & Co, who also won Best Estate Agent, East of England (Bedfordshire, Cambridgeshire and Huntingdonshire at The ESTAS. As JET Software and Reapit were entertaining several new clients at the event, the opportunity to gain a ‘royal seal of approval’ was also taken with two more agencies; Auction House London and Drivers & Norris, who signed up to JET Software on the day with Queenie as a witness. Reapit and JET Software clients had a good day all round with award wins for Balgores, Holroyds Keighley, Michael Poole, Webbersand a large number of the Countrywide brands including Hamptons and John D Wood. A right royal whale of a time was had by all, but Simon Whale also used his speech during the awards for a heartfelt appeal on behalf of his good friend; Dominic Subbiani from FBM who was diagnosed with Huntingdon’s Disease earlier this year. View all photos taken at the event on our Facebook Page and tag yourself!